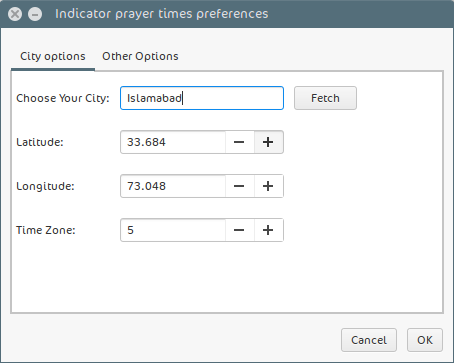 Add prayer times to Ubuntu Unity Indicator Panel | Say to the believing men.. I just wanted to take a moment to share this small nifty program that I have running on my Ubuntu 16.04 installation. It very accurately tells me prayer times and shows a small popup 15 minutes before the time for a specific Salah enters. The best thing about it is that it completely blends in the design of the Ubuntu Unity UI and gives the feel of a System App. Now, by default the app shows remaining time till the next Salah, and the icon in the indicator too is a little bit weird (in my humble opinion). So I went ahead and modified the app a little bit to suit my theme and made it show the time of the next Salah instead of the number of minutes remaining to it. I am using the Ubuntu Paper (inspired by material design) theme. And if some of you would like the app the way it looks on my screen, please feel free to download these files below and patch the app with these files (I'll tell you how) and your indicator panel will look exactly like mine. Basically all you have to do is to copy the indicator-prayer-times file to /usr/bin/directory and the SVG Icon to /usr/share/icons/hicolor/scalable/apps/ folder. If you face trouble moving the file to that directory, you can simply open the file browser as admin and use it to copy and paste easily. To do that, simply type: sudo nautilus ./ & in a terminal. As Salam O Alaikum bro, Its a nice app for muslims to get notifications and updates regarding Salah. 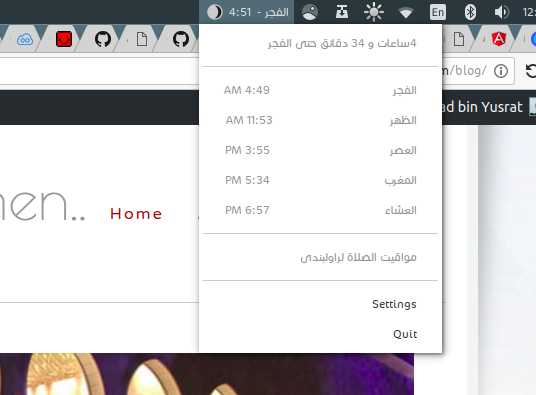 I have successfully installed your app in my kubuntu 18.04. but i am getting the issue regarding timings. I live in Lahore, Pakistan and here Salah timings are different than what app shows me. I have not only set my city in the settings but also my coordinations even timezone itself. Still i am getting the wrong timings. Kindly guide how to fix this issue ? Can you share the screenshot please? it cannot change to my city, why is it? Brother, you can click on the prayer times icon in the notification area and then click settings. There you will see a text box in front of "choose your city". You can type the name of your city and click Fetch. This will update the coordinates of your city. You can also look for your location's coordinates manually and enter it in the settings screen. After clicking ok the app will refresh and show you your updated prayer times. 1,702 people have read this article.